Cucumbers are low in calories and offer many health benefits, making them great for daily consumption. To ensure maximum freshness and nutritional benefits, you should always choose locally produced cucumbers. Provides a quick boost of energy. Cucumbers are rich in vitamin B, which helps nourish the brain and improve your mood. If you need a quick pick-me-up, grab a fresh cucumber. Hydrates the body, helps you lose weight and promotes healthy digestion. Cucumbers are low in calories and have a 95% water content. This helps hydrate your body, manage you weight, flush out toxins, and promotes healthy digestion. Avoid peeling your cucumbers, as cucumber peel is a good source of vitamin C.
Helps care for your skin and hair. Cucumber peel can be used instead of aloe for alleviating skin irritation or sunburn. If your eyes are puffy in the morning, placing a slice of cucumber or cucumber peel on your eyelids will help reduce the swelling. Fresh cucumber juice is great for rinsing your hair after washing. It makes your hair stronger and reduces the risk of hair loss. Helps keep blood pressure under control and reduces cholesterol levels. It has been scientifically proven that compounds known as sterols contained in cucumber help lower cholesterol. Fibre, potassium, and magnesium help keep your blood pressure stable. Fortifies joints and reduces arthritis pain. Cucumbers are an excellent source of silicon dioxide, which helps alleviate joint problems by strengthening connective tissues. Cucumber juice mixed with carrot juice relieves gout and arthritis pain by helping lower uric acid levels in the body. Freshen your breath. Hold a slice of cucumber against the roof of your mouth for 30 seconds – the compounds contained in the cucumber kill the odour-producing bacteria in your mouth. Helps prevent headaches and hangovers. Eating a bit of fresh cucumber after a night of partying provides your body with the sugar, vitamin B and liquids necessary for reducing the risk of developing a headache the morning after. To relieve heartburn, eat a couple of slices of cucumber with every meal. Before showering, rub the surface of your bathroom mirror with a slice of cucumber to prevent the mirror from misting up. 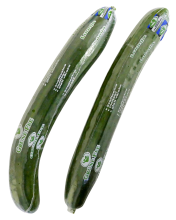 Plastic-wrapped Grüne Fee cucumbers are best stored between +12 and +14 °C. Due to the high water content of cucumbers, keeping them in a warm location will slowly cause the water to evaporate and the cucumbers to become shrivelled. While cucumbers are sensitive to cold, it is still better to keep them in the refrigerator than in a warm location. Note! Avoid storing cucumbers next to bananas or citrus fruits: this will trigger chemical reactions that can cause cucumbers to yellow and spoil rapidly. Sour varieties of apples and tomatoes can also have the same effect. Therefore, you should keep cucumbers separately from these fruits for a significantly longer shelf life.